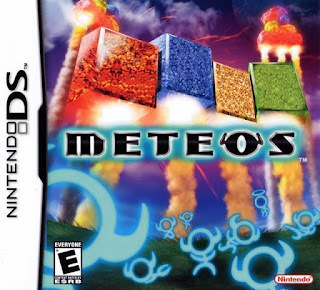 Meteos NDS apk android for DraStic free download working on mobile and pc,Nintendo DS Emulator A planet called Meteos has started to explode. 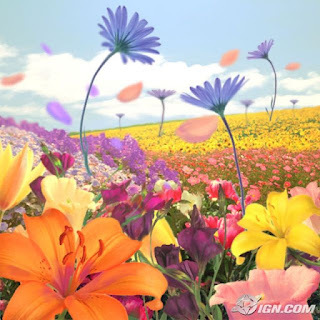 Fragments of the planet become and endless stream of meteors, putting your planet in peril. There’s only one means of saving the planet. 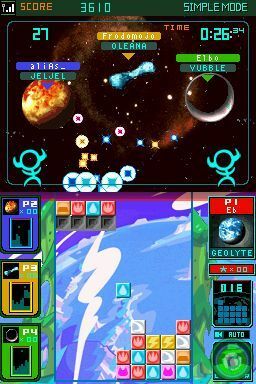 Send the falling meteors back into space with the power of the Nintendo DS — use the touch pen to move blocks around the play field, as lining up three or more of the same color blocks either horizontally or vertically will group the blocks together into a clump and go flying back into space to help stop the onslaught of debris. Meteos is produced by Tetsuya Mizuguchi of Space Channel 5 fame, and is designed by Masahiro Sakurai of Nintendo’s HAL Laboratories. Features more than 30 planets, four-player multiplayer (one cartridge), and multiple gameplay modes.Defend more than 30 planets, each with its own alien race, theme music, block style and gravitational laws. Explore planets in Star Trip, challenge CPU players of any skill, play multiplayer, survive deluge mode or spend launched Meteos to unlock new planets and features. Link wirelessly with up to three friends and have a war of the worlds as players select which planet to launch their Meteos toward. Team up, customize items or establish time or stock limits – players can play however they like. Using DS Download Play, players can take on up to three friends with only one game card. Game Storyline: An evil planet named Meteo has sent asteroid storms all over the galaxy. All planets are in peril, and each must align the falling meteors by similar group to launch them back into space and save their worlds. Characters: Meteo (which looks like a giant, evil eye) and more than 30 alien races, each with a distinctive look and musical theme. How to progress through the game: As blocks fall from above, players must align similar designs by groups of three or more to launch them back up. Players can move blocks only vertically (preferably with the stylus, although the game can be played with the plus control pad). Each planet has its own gravitational rules and block style, so as players unlock new ones, they must learn new skills. There are many modes, and in all of them players earn Meteos – anything launched off the top of the screen goes into a bank, and players can then spend them to unlock new planets, items, features and modes. 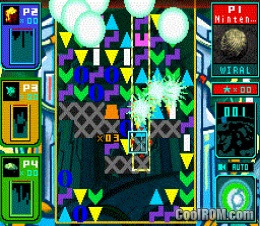 Special powers/weapons/moves/features: There are an incredible number of modes, from Star Trip (progress from planet to planet) to wireless multiplayer to deluge mode, where the Meteos fall at a steadily increasing rate. Not only that, but almost every mode is customizable, allowing players to set the difficulty level of their opponents, time or stock limits, or even item sets. Items vary from vision-obscuring smokescreens to Meteos-destroying hammers. Besides an instantly addictive multiplayer mode, this game also features DS Download Play, allowing players to fight up to three friends with just one game card.